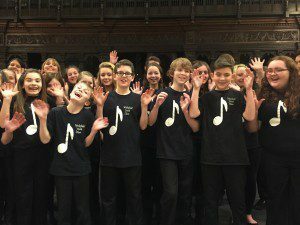 Wakefield Youth Choir is one of Wakefield’s most exciting young choirs. Formed in 1993, it provides advanced singing opportunities for young people in the district from nine to eighteen years. The choir rehearses each Wednesday evening between 4.15pm and 5.45pm at Manygates Music Centre and is directed by Geraldine Gaunt and Phil Needham. Entrance to the choir is by audition and is open to anyone over the age of nine. The range of repertoire is broad, encouraging the singers to appreciate and understand a wide variety of musical styles. The choir regularly gives concerts and has recently appeared on the television programme ‘Songs of Praise.’ Some of the boy members featured in a recent Plusnet advert filmed on Ilkley Moor. The choir frequently records songs for educational CD’s composed by Geraldine and Phil. For further information please contact the music office.